Store and play with 5 of your favorite kids hot-wheels, or matchbox cars on the town with this handy keep safe wallet. Each wallet had 5 pleated pockets to fit your cars in without bunching the wallet. Pleats are made slightly large for you to fit large trucks or vans, firetrucks, or medical vehicles too. Each wallet is made with cotton fabric and lined with sturdy fleece and structured interfacing. 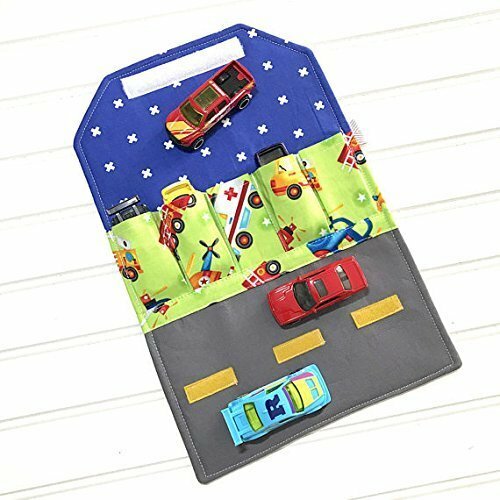 Great for :: Restaurants Hospital visits Airplanes Buses Car rides and much more.... Front flap folds out into a playful road with wool felt dividers. This item can be machine washed and ironed.Please make sure that you do not iron over the Velcro. Care instructions are included with item. wallet measures approx 5 x 8.5 when closed approx 8.5 x 13 when fully open. Wallets DO NOT come with cars, but are packaged and ready for gift giving. Inside fabric accent color may vary from photo. If you have any questions about this product by SewFantastic Handmade, contact us by completing and submitting the form below. If you are looking for a specif part number, please include it with your message.